A Turkish Armenian emigrant, Sarkes Tarzian held engineering posts with Atwater-Kent and RCA, before forming his own company Sarkes Tarzian Inc. in Bloomington in 1944. The company eventually employed 2,000 in the manufacture of television tuners and selenium rectifiers. Building much of his own equipment, Tarzian put WTTS Radio on the air in 1946 and WTTV, Bloomington, on the air in 1949 as the state’s second TV station. 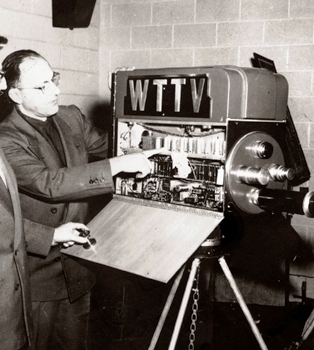 The first few years WTTV operated just two hours a day, 7-9pm. The TV station later moved to Indianapolis, and was sold in 1978. Sarkes Tarzian also owned TV stations in Chattanooga and Reno, radio stations in Fort Wayne, and published newspapers in Bloomington and Indianapolis. Tarzian died October 7, 1987.